Japanese submarines initiated the first shore bom­bard­ments of the war with an attack on the U.S. Navy base at John­ston Island in the Paci­fic in mid-Decem­ber 1941, just days after Japa­nese carrier-based planes had destroyed, in their sur­prise attack on Pearl Harbor, Hawaii, one half of the United States’ naval power. Japa­nese sub­marines briefly shelled the Amer­i­can Paci­fic outpost on Mid­way Island in Janu­ary 1942. The following month, on this date, Febru­ary 23, 1942, Japa­nese sub­marine I‑17 made the first enemy attack on the U.S. main­land since the War of 1812. Shortly after 7 p.m., the I‑17 sur­faced several hun­dred yards off a beach west of Santa Bar­bara, Califor­nia, and for the next 20 minutes fired 17 rounds from her 140mm gun at the Rich­field (now ARCO) avia­tion fuel stor­age tanks on the bluff top behind the beach. The shots missed the tanks but destroyed an oil derrick and damaged a pier and a pump house. News of the Ell­wood oil field shelling trig­gered an invasion scare up and down the West Coast. Not every­one bought the govern­ment’s assur­ances. The Long Beach [California] Inde­pen­dent edi­tori­alized: “There is a mys­terious reti­cence about the whole affair and it appears that some form of cen­sor­ship is trying to halt dis­cus­sion on the matter.” Others spec­u­lated that the in­ci­dent was either staged or exag­gerated to give defense in­dus­tries like Douglas (now Boeing) Air­craft in Long Beach and Santa Monica an excuse to move further in­land. (Secre­tary Knox encouraged their moving.) 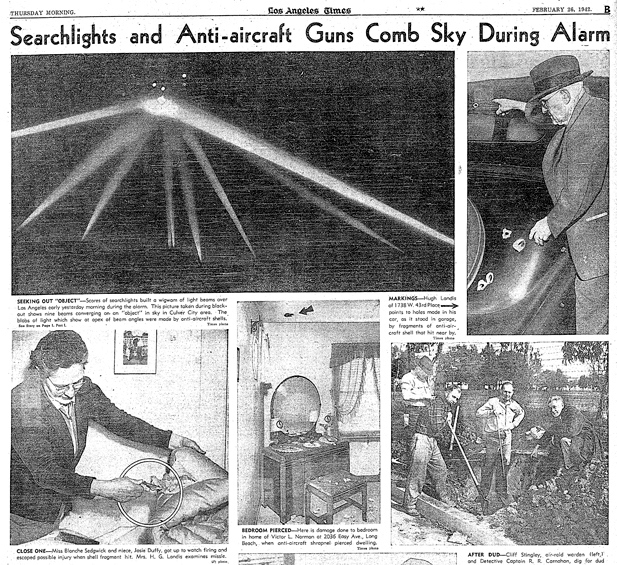 The Great Los Angeles Air Raid was front-page news and fodder for news­paper edi­tors around the nation. Ameri­cans were living through scary times, so people believed. Many West Coast resi­dents imagined the worst—that after the surprise Japa­nese air and naval attack on Pearl Harbor, Hawaii, 2‑1/2 months before, enemy planes might suddenly show up in the middle of the night and unload their bombs on their own com­mu­ni­ties, or that a Japa­nese inva­sion force might appear off their undefended beaches, hook up with tens of thou­sands of Ameri­can-born Japa­nese and Japa­nese nationals living among them, and jointly unleash may­hem and destruc­tion. Truth was, as it turned out, during 1941 and 1942 I‑17 was one of 10 Japa­nese sub­marines that routinely patrolled off the Pacific West Coast, Alaska, and Baja California. And, with the excep­tion of hun­dreds of hydrogen-filled balloon bombs (fūsen bakudan) Japan sent aloft on the jet stream to drop, hit or (mostly) miss, on the North Amer­i­can con­ti­nent in 1944‑1945, that was about as scary as it got. Left: The mammoth Sen-toku, or I‑400-class submarine. Difficult though it is, note the long water-tight, tube-like plane hangar on the sub’s aft deck and the forward catapult. Japanese plans called for building a fleet of 18 I‑400-class submarines, at 400 ft long and displacing 6,670 tons by far the largest and among the most deadly subs ever built until the 1960s. The subs were designed as under­water air­craft carriers, each equipped with three Aichi M6A1 sea­plane bombers. Their mis­sion was to travel more than halfway around the world (the I‑400 had a range of over 30,000 nau­ti­cal miles and carried a crew of close to 200 men), sur­face off the North Amer­i­can or Pana­manian coast, and launch their deadly air attack. A gen­er­a­tion ahead of their time, only three Sen-tokus were com­pleted; two entered service without seeing com­bat. Right: An Aichi M6A1 Seiran seaplane, the type carried aboard I-400-class subs. The brain­child of Adm. Isoroku Yama­moto, the archi­tect of the Japa­nese naval attack on Pearl Harbor, the I‑400–class sub­marine was designed to carry three Seirans (which trans­lates as “storm from a clear sky”), each cap­able of carrying one 1,800‑lb bomb for up to 620 miles. The late-war I‑400–class “wonder weapon” was unknown to U.S. intel­ligence, despite having broken the Japanese naval code.